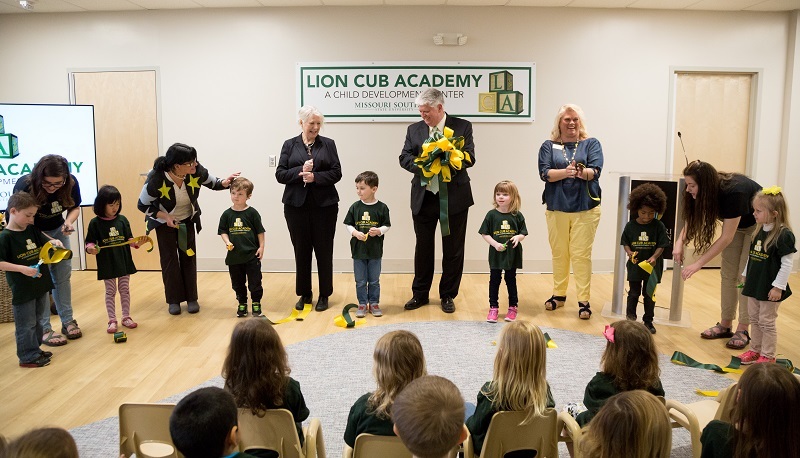 Members of Missouri Southern’s administration were joined by some of the youngest members of the Lion family for a ribbon-cutting ceremony Tuesday, March 28, at the new Lion Cub Academy. Located at 3600 Newman Road, the former Child Development Center has moved from Taylor Education Building to its new location, where it will continue to provide care for the children of students, faculty, staff and alumni, from ages 1 to 5. The increased space – 10,736 square feet, nearly double what was available in Taylor – will allow the center to expand its enrollment from 59 children to more than 90. The ceremony included remarks from Dr. Alan Marble, president of Missouri Southern; Dr. Deborah Brown, dean of the School of Education; and Nikki Tappana, director of the center. “A child’s development is a continuous process,” said Brown. “As such, this center is designed to create an atmosphere of security and trust, where children can develop emotionally, socially, physically and intellectually – a place where they can learn to learn. Marble emphasized the importance of the Lion Cub Academy to education students at Missouri Southern. “The center provides our students with an excellent environment to further their studies in early childhood education,” he said. “This invaluable, hands-on experience can increase their understanding of the principles of child development, help them create a healthy environment for children and further their passion for helping kids develop a lifelong love for learning.